The next generation of grinders is here: The KG-22W and KG-22W-XP are so advanced they don’t require washers to internally protect their gear transmissions.Also, their handle design allows for an effortless headstock removal. 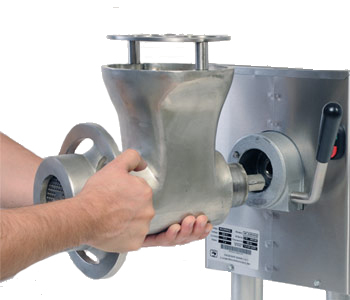 This Heavy Duty model can grind over 1,700 lbs of ground meat in one hour. This is about four times the capacity of other grinders in the market. Thanks to its powerful motor and dependable gear transmission the KG-22 grinders will do all the hard work for you. 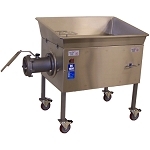 Its powerful oil bathed steel gear transmission with no belts or pulley will guarantee that your grinder will labor long hours for years to come. You can switch plates to create salsas, marmalades, creams and even guacamole. 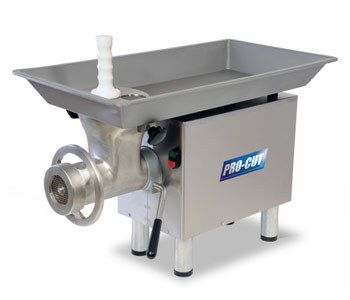 As you would expect from Pro-Cut, its sleek stainless steel construction will make cleaning a breeze. 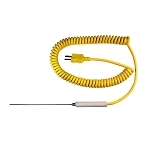 You will not require tools to disassemble the head. Machine Size: 16.5" x 33" x 26"
Overall Size: 16.5" x 33" x 26"